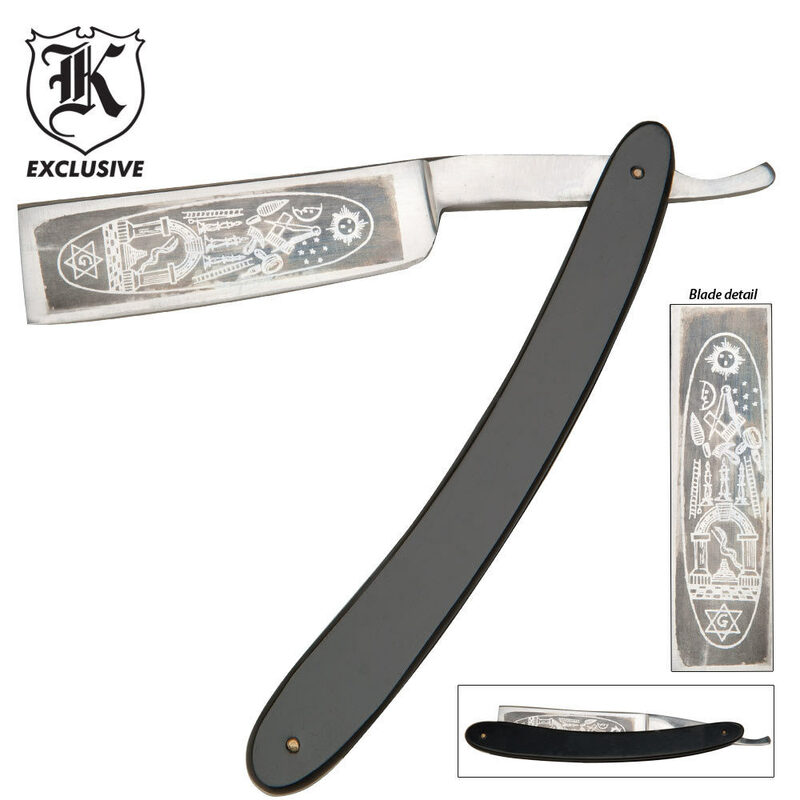 Masonic Straight Razor | BUDK.com - Knives & Swords At The Lowest Prices! Get a razor-sharp shave while searching for the light! This unique Masonic folding straight razor offers a stainless steel 4 1/2" blade with a mirror finish and Free Mason symbols right on the blade. This razor is almost too sharp to mail - it could cut through the packaging very easily if it opened in shipment. As some have said before me, you could get a really deep cut when removing the oil preservative from it, so handle with care. Mine had a really good edge with no defects, but a touch wiith a slip stone and follow it with a good stropping and you can do some serious shaving with this thing. As soon as I get a chance I am going to try it out. The only things I found to be a bit disappointing were the blade etch was a bit fuzzy and a 1/8 inch of one corner was missing, and the handle material could have been contourd around the margins, a bit of a rounded chamfer profile would make this a much nicer razor in the hand. I'm keeping it as these little flaws add character and do not in any way affect the functional aspects of this piece. I'm glad I finally ordered this, VERY happy with it ( only wished it ca me sharper ) !!! This is one awesome straight razor. I'm no Mason, but it is still a good, lethal, and concealable razor. The handle isn't in that good shape, but that's what you get for $6.00. Good size razor, good steel sharp also, but need a razor strap to make it right for shaving. The handle is flimsy plastic. I give it a 4 because of the handle.